Harm reduction database Wales: take home naloxone 2015–16. Report charting the roll-out of ‘take-home naloxone’ in Wales up to 2016, a harm-reduction measure implemented to prevent deaths involving opiate-type drugs. Summary Take-home naloxone was piloted in selected areas in Wales, and subsequently extended across Wales. The featured report provides data on the provision of take-home naloxone kits and related training in Wales from 1st April 2015 to 31st March 2016, as recorded on the Harm Reduction Database Wales. To compare with previous years, see the 2014–15 and 2013–14 reports. Naloxone is known as an ‘opioid antidote’. It works quickly after administration to counteract the effects of heroin and other opiate-type drugs – restoring breathing, bringing the patient to consciousness, and ultimately preventing fatal poisoning. In May 2013, the naloxone kit Prenoxad became approved in the UK for use in opioid overdose emergencies by non-medical personnel. 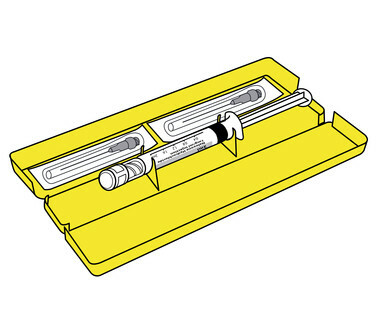 The kit includes a pre-filled syringe, product instructions, and relevant first aid guidelines. Other kits have also been approved for general use. When the data was being collected for the featured report, one area in Wales was still transitioning from a ‘Welsh kit’ to Prenoxad – the former had only a single dose, so multiple packs were typically given to users. For more information on naloxone and the context for implementing it in the UK, see this dedicated Effectiveness Bank hot topic. • 2,171 people in Wales were trained to administer naloxone. 94% of those accessing training were service users, with the remaining being family, partner, carers, or professionals. 56% had never been trained before. • 3,186 take-home naloxone kits were issued – an increase of over 14 per cent on the previous year. • 1,058 new individuals were supplied with take-home naloxone and 937 existing service users were re-supplied. • 17% of the men issued take-home naloxone (146 in number) were issued it on release from prison. • Take-home naloxone was reportedly used in 433 drug poisoning events. In line with previous years, the majority (60%) of all reported poisonings occurred within a private residence. • Emergency services were called in 63% of cases, a slight increase from the previous year (58%). Over half of patients (58%) were taken to hospital, and of these, under half (42%) refused hospital admission. • The use of take-home naloxone was reported once for every nine individuals registered as a carrier of take-home naloxone. • Of the people whose kit was used during an opioid poisoning event, two-thirds (66%) were men, and the most common age group (23%) was 30–34 years. Only 6% were under the age of 25. Of those newly issued with take-home naloxone, 71% were men and 22% aged 30–34. • As with previous years, the demographic profile of those whose take-home naloxone kit was used in a poisoning event included people living in non-secure accommodation (48%), people using multiple drugs (79%), and people having experienced at least one previous non-fatal drug poisoning (64%). The report recommends optimising distribution of take-home naloxone with assertive outreach, and further provision taking place within community pharmacy needle and syringe programmes. This is particularly important for engaging with marginalised groups such as young people, the homeless, ethnic minority populations, and those not in contact with specialist services. Further efforts should also be focussed on the delivery of training and provision of take-home naloxone to parents and wider family members, partners, carers, professionals and peers of those at risk of opioid drug poisoning. commentary Across the UK, deaths related to drug misuse rose steeply between 2012 and 2015, driven by a corresponding rise in deaths involving opiate-type drugs, and in particular, heroin. One Effectiveness Bank hot topic has explored the data behind these trends and the general response to drug deaths, while another has focused in on the life-saving potential of naloxone. Of the estimated 25,767 opioid users in Wales, under half (10,492) accessed specialist and community pharmacy needle and syringe services between 2014 and 2015 according to the Harm Reduction Database Wales. If access to these services can be taken as a rough indication of a potential offer of naloxone, then there are many more users yet to be reached. The 2011 evaluation of the Welsh pilot take-home naloxone project (1 2) found promising results, leading to its roll-out as a national programme. Among these findings was that compared to peers in a non-naloxone comparison group, people who had received training and access to naloxone more frequently used the recovery position and called an ambulance during overdose events. In the featured paper, emergency services were called in about two-thirds of cases, which although an increase from the previous year, still doesn’t yet meet the advice of Public Health England that an ambulance be called each time naloxone is administered.